When I was first asked to write a piece on my beloved track toy, I thought, If they only knew. The damn thing's held together with zip ties and only looks good from 10 feet away. Then it occurred to me that just about every dedicated track car is held together with zip ties, and looking good from only 10 feet away is better than a lot of the cars you'll see on track. I've already discussed my deep-seeded track addiction, so think of this as the back story. Meet Blau. My track-only E30 that, like nearly every project car in recorded history, will never really be finished. If any of you are unfamiliar with the E30, there are exactly two ways of looking at BMW's second-generation 3-Series. First: It was the ultimate yuppie machine back in the 1980s. 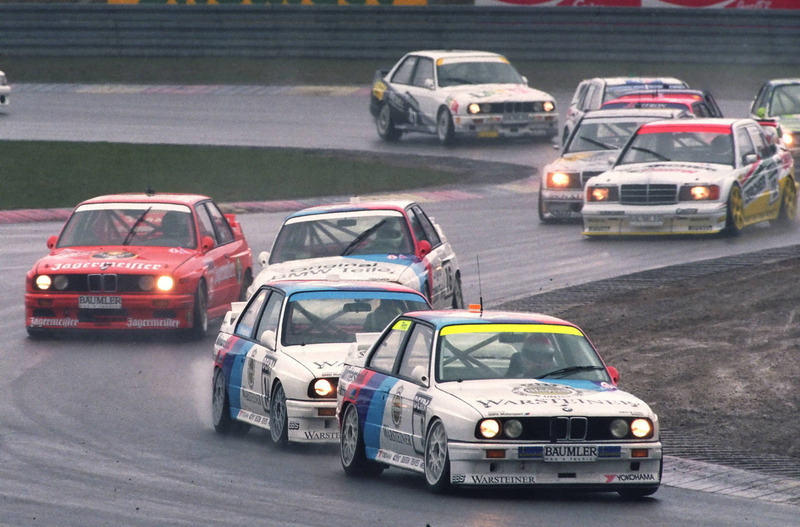 Second: To date, it's the most successful race car of all time, with an absolutely insane number of wins going to the E30 M3. *Some of you will probably note that it's purplish in color. I'm colorblind, and no one bothered to tell me the car wasn't really blue until months after I bought it. Some purists will say I destroyed a perfectly fine E30 to turn it into what it is today, but the truth is, when I bought the car for just $2,250 in 2007, it desperately needed a replacement of nearly everything to do with the suspension and steering. It also had so much tree sap on the paint it took two full clay bars to remove it all. At first, I went with a very basic suspension, and a steering rack from a Z3—a BMW trick to get a much quicker steering ratio. Then I took it to my first autocross, and the car's street days were numbered. My background prior to the E30 was mostly Mustangs, so I knew a lot about going fast in a straight line, then almost stopping to get around a corner, before carefully applying the throttle again. The E30 was the polar opposite, and from the very first time I took it to a track (shown here), it felt like an extension of my body. There really was no decision to make: this was going to be a dedicated track car, and as such it needed a proper roll cage. That meant making a few, um, changes to the interior. All the excess mass needed to support the sunroof was the first thing to go, followed by the seats and carpeting. Then it got tough. To keep your car nice and quiet, manufacturers use tar as a sound deadener. It's ridiculously heavy, and while the Internet's full of ways to get it out (ranging from cool stuff like freezing it with dry ice, to soaking it in WD40), the only thing that worked for me was using a paint scraper with one hand while blasting it with a heat gun in the other. Learn from my mistake. Don't do something that requires using a heat gun for hours on end if it's still summer. Then came the fun stuff. If you've never gotten to watch people building a roll cage, find a way to do so. You'll learn so much about everything from metallurgy to how every piece of the car is tied together, and you'll develop a much better appreciation for all the extremely complex and precise work that goes into it. For example, these welds are of an extremely good quality, but they're infinitely more impressive when you think about how difficult this particular section is to reach. Really contemplate what's going on here, then imagine repeating the process literally dozens of times. I paid more for the cage than I did for the whole car, and I'm absolutely certain it should've cost a lot more. Once it was finally finished and the car was safely in my garage, I got to work covering everything with an industrial-grade rust preventing paint, then installing things like my racing seats and steering wheel with a quick release mechanism so I can get in and out more easily... and more quickly, should I really screw up some day and find myself surrounded by flames. Once car was driveable again, it was springtime. Even before I got it to the track, an autocross taught me more about cars than any amount of driving or studying beforehand. Because the cage prevented the chassis from flexing, I could suddenly feel what every suspension component was doing. Picturing each component interacting with the others in real time was like a lightbulb turning on for my personal development as a driver. By the next year it was time for another step. A Z3 M Coupe—like this one—had died a vicious death, and its suspension offered a very nice upgrade to both the E30's geometry, and the brakes. Of course it's all upgraded from stock, and there's other stuff too, like a brake bias adjuster so I can reach down and adjust the car's brake balance without getting out of the car. The bottom line is that when I'm out on track and everything's warmed up, it's simply amazing, and it's immensely enjoyable reeling in some of the much more expensive, much more powerful cars out there. I've been fortunate enough to drive some of the best cars currently made, and the simple fact is that the only cars I've ever even ridden in that are better through the corners than my trusty little E30 are proper, bona fide race cars running slicks instead of street tires. Maybe some day I'll actually get around to finishing my original plans for it. Aaron Miller is the Rides editor for Supercompressor, and can be found on Twitter. He can't thank everyone that helped with this car over the years, but he wants to single out Bob, Craig, Kyle, and Bo for some hard work, great assistance, and insightful direction.